From one of America's foremost young literary voices, a transcendent portrait of the unbearable anguish of grief and the enduring power of familial love. What does it mean to mourn today, in a culture that has largely set aside rituals that acknowledge grief? After her mother died of cancer at the age of fifty-five, Meghan O'Rourke found that nothing had prepared her for the intensity of her sorrow. In the first anguished days, she began to create a record of her interior life as a mourner, trying to capture the paradox of grief-its monumental agony and microscopic intimacies-an endeavor that ultimately bloomed into a profound look at how caring for her mother during her illness changed and strengthened their bond. O'Rourke's story is one of a life gone off the rails, of how watching her mother's illness-and separating from her husband-left her fundamentally altered. But it is also one of resilience, as she observes her family persevere even in the face of immeasurable loss. With lyricism and unswerving candor, The Long Goodbye conveys the fleeting moments of joy that make up a life, and the way memory can lead us out of the jagged darkness of loss. Effortlessly blending research and reflection, the personal and the universal, it is not only an exceptional memoir, but a necessary one. Meghan O’Rourke is the author of the poetry collections Once and Halflife. She is a cultural critic for Slate, and her essays and poems have appeared in The New Yorker, The Nation, and other publications. She lives in Brooklyn, New York. 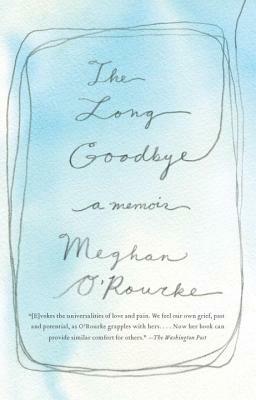 "Meghan O'Rourke, a celebrated poet and critic, writes prose as if she was born to it first. Her memoir The Long Goodbye is emotionally acute, strikingly empathetic, thorough and unstinting intellectually, and of course elegantly wrought. But it's above all a useful book, for life-the good bits and the sad ones, too." "Meghan O'Rourke has written a beautiful memoir about her loss of a truly irreplaceable mother-yes, it is sad, it is in fact heartrending, but it is many things more: courageous, inspiring, wonderfully intelligent and informed, and an intimate portrait of an American family as well." "Meghan O'Rourke is an extraordinary writer, and she offers precious gifts to readers in this powerful memoir. There is the gift of entering her family, with its vibrant characters and culture. There is the gift of her profound insights into the experience of grief, its grip and the diverse ways we struggle to reenter a world where joy is felt. But most of all, there is her gift of showing us how love prevails after even the most devastating loss." The Long Goodbye is in some ways as much about memory as it is about grief. How do you think our memories shape us? Have you experienced the loss of someone close to you? If so, what elements of the author's account rang true for you? If not, what aspects of the story did you connect with? What does the author mean by "am I really she who has woken up again without a mother" (296)? Does being someone's child, someone's daughter, change once a mother is gone? If so, how? How does the author's mother respond emotionally and psychologically to her diagnosis? What was your reaction to these scenes? "If I told the story of her death, I could understand it better, make sense of it—perhaps even change it" (139). How does the act of writing help the author during her mother's death and in the time after? Have you ever written things down in order to better understand them? "If I told the story of her death, I could understand it better, make sense of it—perhaps even change it" (139). How does the act of writing help the author during her mother's death and in the time after? Have you ever written things down in order to better understand them? What rituals or little things bring the author's mother and her loved ones joy in her last days? If you've witnessed or been with a loved one in their final months can you relate to this? What activities or moments come to mind? The author argues that in our society mourners are largely left alone with their grief. How does this affect the author? If you have suffered a loss, were you affected by feelings of isolation? What, if anything, might make it easier for mourners to grieve? Hamlet and Orpheus, writings by C.S. Lewis and Raymond Carver—how do these characters and works on loss and dying help the author make sense of her experience? What aspects of the grieving process do they unlock for her? Are there characters or stories that have helped you define loss? How does the author begin to "experience" her mother after her death? Where does she experience her presence, and what encounters give her solace? "We are the words; we are the music; we are the thing itself. And I see this when I have a shock… There is a pattern hid behind the cotton wool" (Virginia Woolf, 289). How does Woolf's idea that there is, in the author's words, "an order behind our existence," give O'Rourke hope? Do you find these words comforting? How does the author feel about the role of hospitals in death today? Hospice? What might we do to make dying less bureaucratic, in her view? In yours? In the time leading up to her mother's death, the author reflects on memories of her childhood. How do memories bring us comfort? Can memories also be a way to honor those who have died? The author writes about how her mother's illness affected each member of her family differently. Are our family roles redefined by a loss?